Note: You can enter this giveaway three (3) times per e-mail address per day. Deadline is 11:59PM ET 10.5.18. When the going gets tough, the tough get baking. 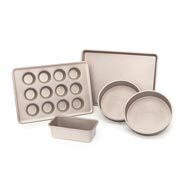 The five-piece bakeware set from OXO features nonstick surfaces for even baking and easy clean up. Heavy-grade aluminized steel provides even heat distribution and makes for lasting durability and stability. The set includes two 9-inch round cake pans so you can make a delectable Hershey’s Chocolate Cake, one loaf pan, one 12-cup muffin tin great for muffins or these Baked Eggs for brunch, and one half-sheet pan. All of the pans feature visible dimension markings for quick size identification and square-rolled edges provide a secure grip – so keep calm and bake on. NO PURCHASE NECESSARY TO ENTER OR WIN. Void where prohibited by law. Open to legal residents of the 50 U.S., D.C. and Canada (excluding Quebec) who are at least eighteen years old at the time of entry and have internet access. Begins on 8.9.18 at 12:00:00 a.m. ET and ends on 10.5.18 at 11:59:59 p.m. ET. To enter the giveaway, submit your full name and email address on this form. Odds of winning this giveaway depend on the total number of eligible entries received. Only three (3) entries per email address per day. Sponsored by Leite’s Culinaria, Inc. For more information, visit our Official Rules. For a list of winners, check out our Very Happy Winners page. Be sure to add giveaways@leitesculinaria.com to ensure notification if you are the winner.